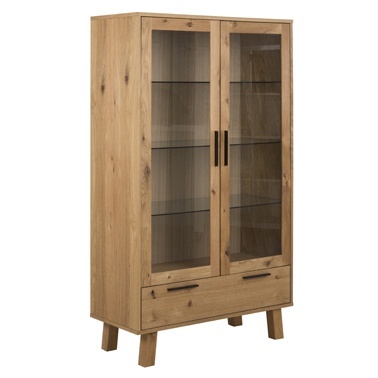 Scandi meets Industrial - Chara Glass Display cabinet from our Danish friends at Actona. Made in Wild-Oak Veneer - a natural knotty oak cabinet, with black metal handles, glass shelves, glass doors, and a handy drawer at the bottom on metal runners. Keep your cute collectables on display but away form dust and sticky fingers!